Non-recording, non-controlling type pyrometer for high temperatures. reason, all large shops have a master pyrometer to check the pyrometers in use in the furnaces but the small shop which does not use the pyrometer every day can return it to the manufacturer periodically to be checked and repaired if necessary. There are three general types of heat treatment furnaces in use, the gas-fired, the oil-fired and the electric, the last being the most expensive of the three to purchase but probably being the easiest to operate. Commercial-type electric hardening and tempering furnace which may be simplified and easily built in any small shop. against this arch and are not turned directly upon the work, for this direct flame would ruin the steel, due to uneven heating. The electric furnace, of course, does not require an arched roof, as no flame is present and is the type best adapted for the actual hardening and tempering of steel. 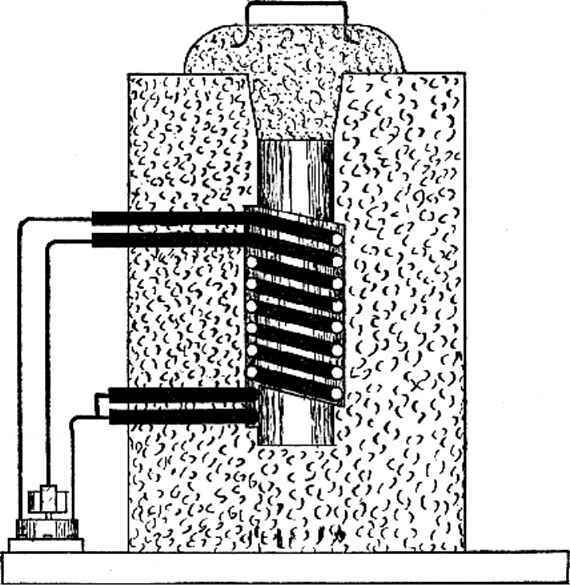 Construction detail of commercial-type electric furnace, showing "Cal-rod" type heating elements in place on sides and bottom. being used. The roof is of arched type for the flame-type furnace and the door is made the full width of the furnace. Doors are of steel, lined with fire brick and the inside of the furnace and the door is plastered with fire clay. A shelf is made outside the door so that pots or boxes used when case-hardening may be drawn out upon this shelf and then picked up with hooks or tongs. 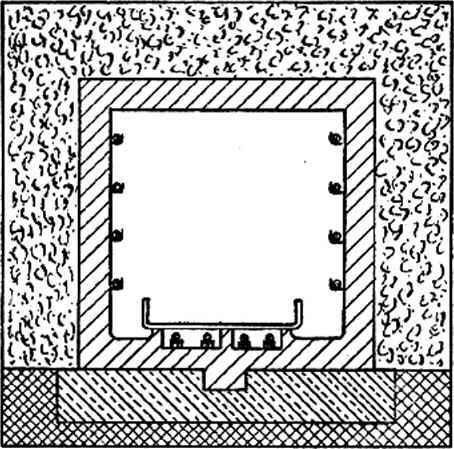 Bolts are set in the concrete base around the sides of the furnace so that steel bands can be drawn over the brick work to hold the furnace together, which is necessary due to the expansion and contraction caused by heating and cooling. The flame-type furnaces must be connected to a flue and have dampers in the pipe so that the rate of cooling may be controlled. Burners are let into ports along both sides and so set that their flame enters at a tangent to the roof arch. Shop built, gas furnace of fire brick lined with fire clay, set upon a concrete base. A steel muffle, removable through the door opening, is shown in placc with a cut-away scction showing ports in gas burner, two of which arc used. vent surface decarbonization of the steel. This also applies while annealing steel but does not matter in case-hardening. Also in using the furnace as a muffle furnace in hardening or annealing, the steel is protected by the muffle and the type of flame does not much matter. 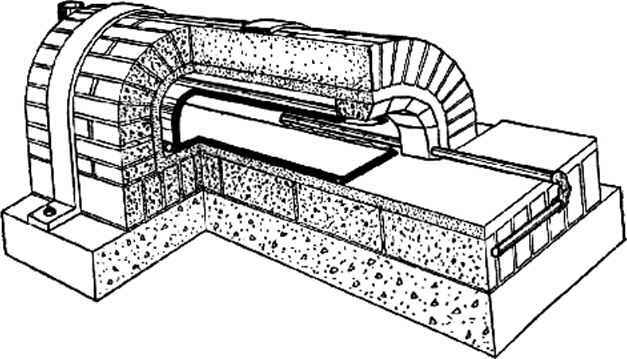 The electric furnace is built in the same way as the flame-type in regard to construction of base, walls and door but it does not require an arched roof, a flue connection, (although it does require a vent with damper) nor are there ports along the sides for burners, as the enclosed type of burner can be used, such as the "Calrod" element and these are fastened to roof and sides, inside the furnace. 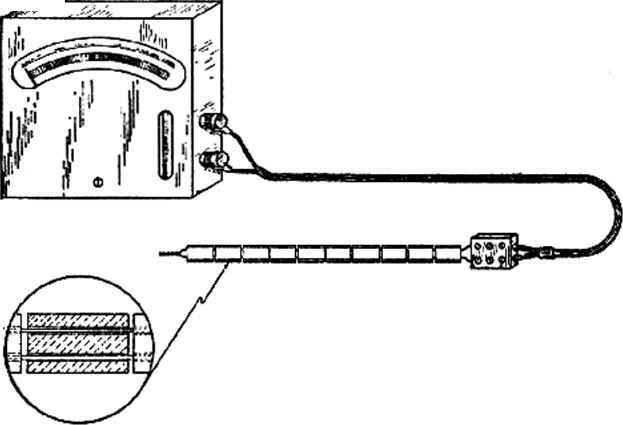 Pyrometer connections into the furnace should be arranged at the farthest distance from the flame or heating element and should be loose enough so that in case the tube surrounding the element breaks, the element can be immediately withdrawn from the furnace, to prevent damage by the heat. The high-speed steels require higher temperatures for treatment than the carbon-steels need. Temperatures for high-speed steel range from 2100 degrees Fahrenheit upward, while those for carbon-steel range from 1350 to 1650 degrees Fahrenheit for annealing, normalizing and hardening and 1500 to 1700 degrees Fahrenheit for case-hardening. For hardening and tempering the carbon-steels, heating in a lead or salt bath, usually barium-chloride, or a bath of cyanide-of-potassium has proved very satisfactory. 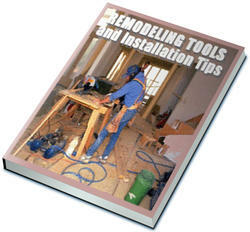 Lead is usually used where the temperature tolerance is narrow. The lead should be chemically pure and especially free from sulphur, as this injures the steel. The surface of the lead is usually covered with a dusting of charcoal to prevent oxidation and when it is necessary to clean the bath add dry, common salt and stir in with the melted lead. All dirt and foreign matter will rise to the surface and can then be skimmed off. To prevent lead from sticking to the steel, the steel to be heated should be dipped into a solution of one pound of powdered cyanide-of-potas-sium crystals to one gallon of boiling water and thoroughly dried before being placed in the melted lead. As lead gives off poisonous fumes when heated to 1200 degrees or more, the lead bath should be covered with a hooded safety flue to lead these fumes to the outer air. A small, shop-built, electric hardening and tempering furnace for reamers, cutters, firing-pins and small parts. Two "Calrod" elements of 750 or 900 watts are spirally wound to a two inch internal diameter and set in asbestos ccment inside a stovepipe casing, 8" X 12", set upon an asbestos-board base. A three-point range switch is used to connect it to 220 volt, three-wire circuit and a rheostat should be used to control the current and keep the heat from running higher than ncccssary. Total cost about $15.00. used for carbon-steel. The salt forms a film on the steel that adheres to it and cuts down its rate of cooling while being transferred to the quenching bath; in which this film readily leaves the steel. Parts heated in this bath always come out cleaner from the quenching bathy especially high-speed steel. After being used for some time this heating bath shows a tendency to pit the steel and must then be renewed. The cyanide-of-potassium bath has some advantages for carbon-steels in that it prevents scaling and soft spots and also adds an additional percentage of carbon to the surface of the steel, which makes this surface harder. It is however highly poisonous and should be covered with a hood connected to a flue for the fumes are deadly in very small amounts. Steel used for the making of gun parts, or of tools to be subsequently hardened, should be heated to its critical temperature for purposes of annealing and normalizing, so that all strains set up in the steel are relieved before it is machined. This heating to the critical point for normalizing should also be repeated after the part is partly machined, so as to relieve strains set up by the machining process. In the case of tools such as reamers, drills or other cutters that are to cut •exact sizes, this is done just before grinding to rough finish. Carbon or high-speed steels should be brought up to heat slowly and when annealing or normalizing should be cooled very slowly, either by being buried in slaked lime to cool, or better yet by being packed in a cast-iron box or pipe in charcoal, sand or slaked lime, sealed with fire clay and heated in the furnace while so packed; after which the furnace is shut off, all dampers closed and the parts allowed to cool slowly in the furnace, usually over night. Left shows oil tempering bath, with high-temperature mercury thermometer hanging in the bath. 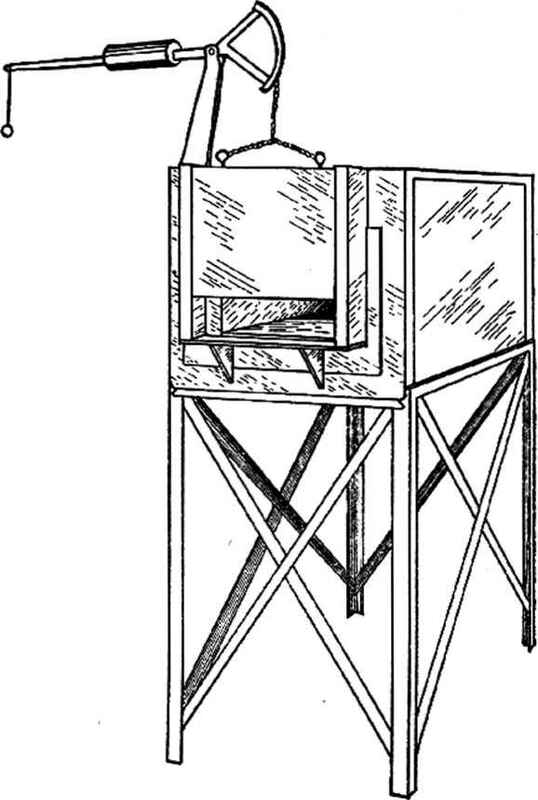 Right shows set up of lead bath or potassium cyanide bath for hardening, showing hood arrangement to carry off the poisonous fumes. As stated before, steel heated to its critical point assumes the finest grain structure possible for it for strength and hardness, and to enable it to retain this strength and hardness it must be quenched at this temperature. For this purpose the quenching bath is used. Water saturated with salt, making a brine, gives the greatest hardness but also the greatest brittleness. Plain soft water of low temperatures, just above freezing, comes next in line, giving slightly less hardness and brittleness. This hardness decreases as the temperature of the water is raised, until it reaches a temperature of about 120 degrees, when the steel quenched in water of this temperature remains comparatively soft. Oil is usually considered the best quenching bath when both hardness and toughness are desired. Linseed and cottonseed oils give very good results on highspeed steel, while sperm or lard-oil is preferred for springs. Good results in hardening carbon-steel are obtained by using a water bath of 60 to 70 degrees temperature with an inch or two of cottonseed oil on top of the water. An air blast is often used to harden high-speed steel. Mercury is sometimes used to harden a carbon drill for use on very hard steel, but it makes the drill very brittle. The quenching bath should be of large enough size so that the part being quenched does not heat the bath. Slender parts of such shapes as drills and reamers should be inserted in the bath endwise and disc shapes edgewise. The parts should be agitated in the bath or the bath agitated by an air jet. Parts which are considerably heavier at one point than at another should always be quenched heavy-part first. Parts should never be dropped to the bottom of the bath or they will have soft spots on the under side. High-speed steels are heated to 1470 or 1500 degrees for annealing or normalizing while packed in cast-iron box or pipe with slaked lime for a period of two hours for small tools and a longer time for large pieces and allowed to cool slowly in the furnace, with the heat shut off. A higher temperature than this is required for hardening high-speed tool-steel. It is usually heated slowly to about 1800 degrees and then heated rapidly to 2200 degrees and quenched in linseed or cottonseed oil, although a dry air blast is sometimes used as a quenching medium. The surface of finished dies or tools must be protected from contact with the air while the steel is heated or the surface of the steel will become oxidized, forming scale. To prevent this, the steel is painted on all exposed surfaces with a mixture of bone-black and sperm-oil if it is to be heated in furnace or forge without being packed in an iron box of slaked lime or charcoal. This mixture will easily wash off in the quenching bath, provided the steel has been heated in a furnace and not exposed to the direct action of the flame. If it is so coated and then heated in a forge without being encased in a box, this coating will protect the surface fairly well but it must be polished off with fine emery cloth afterwards. Finished steel parts or tools may be heated in an open forge provided the articles are packed in a cast-iron box or pipe with slaked lime or charcoal. Use a deep fire and cover the box completely with the live coals. This works very well for annealing or normalizing where the temperature need not run quite as high or be quite so closely controlled as in heating for the hardening process. After carbon-steel tools or parts have been hardened, the temper must be drawn to give them the proper toughness, for in the hardened state they are usually too brittle for use. Drawing the temper, or tempering, is done at a much lower temperature than the hardening process and is much easier to control. It is not necessary to use a pyrometer for this process, as the high temperature, mercury thermometers used for deep-fat frying run up high enough for temperatures used in the tempering process. These thermometers are not expensive, costing from one to two dollars usually. While tempering can be done in an open fire, by watching the colors produced on the polished steel by the rising heat and then quenching the article when the proper color has appeared, this is the poorest method to use in tempering, as colors produced on steel by heat vary with the carbon content of the steel, the more carbon the steel contains the quicker the high temperature colors appear. For this reason it is much better to heat the articles in a balh of some liquid that can be held to exactly the proper temperature. The articles to be tempered are hung in the liquid so that they do not touch either sides or bottom of the container and are left in it long enough to be heated to the same temperature as the bath. The thermometer should be hung in the bath in the same way, clear of sides and bottom, so that the temperature of the bath can be read and the heat properly regulated. Oil is one of the best tempering baths, but this cannot be heated over an open flame or it will catch fire, so if a flame burner of any type is used the flame must be fully covered so that it cannot rise around the pot containing the oil. The modern high-speed electric element used on modern-type electric ranges with its several point control makes an excellent heat for tempering baths. In case an oil bath is used, the pot should be large enough to cover the burner completely, so that fumes from the oil bath will not be ignited. Various alloys of lead may be used for tempering baths. Lead alone melts at too high a temperature for tempering, but lead alloyed with varying amounts of tin will melt at temperatures low enough for tempering. The greater the amount of tin in the lead the lower the melting point will be. Experiments can be made with these alloys and the proper alloy found for the temperature desired by checking the melting points with the thermometer. A sand bath is sometimes used for tempering. The sand should be very clean of course and it may be heated over any type of fire, which is one of its advantages. One of its disadvantages is that it is not as easy to obtain an even temperature in a sand bath as in a liquid bath, so temperatures should be taken at a number of different points throughout the sand bath. If it is necessary to temper parts or tools without a bath of some type, an iron plate should be heated to a low red-heat and the polished parts placed thereon. They must be turned constantly, so that the heating is as even as possible on all sides, and the article is then quenched in oil when the proper color appears. Parts heated in a bath of course require no quenching, as they can become no hotter than the bath. Tempering must be done on the rising heat and not on descending heat. If a part is heated above the proper temperature, it must be put through the hardening process again and then retempercd. Cold parts or tools should not be placed in a hot bath, either the article should be preheated before being placed in the tempering bath or else the article should be placed in a cool bath and the heat brought up. When using a lead bath for either tempering or hardening, the steel will not sink in it, as lead is heavier than steel, so attach parts or tools to stiff wires fastened to a heavy piece laid across the top of the bath or bend the wires at right-angles and put them in holes drilled through the side of the pot above the liquid line. Case-hardening is accomplished by impregnating the surface of steel with carbon, by heating it at high temperatures while packed in an iron or steel box with proper carburizing materials, or by heating the steel in potassium-cyanide in an iron pot. These carburizing boxes may be made of malleable iron, cast-steel or nichrome steel. The steel pots are rather expensive but the ones made of malleable iron are moderate in cost and give a service of from 450 to 500 hours. Nichrome boxes or pots have given several thousand hours of service. Cast-iron boxes are the cheapest and give the shortest service. The boxes should be at least one-half inch thick, with a removable lid of the same thickness. 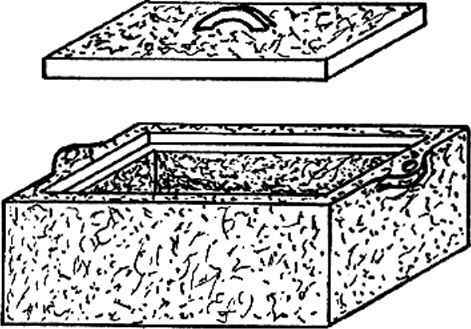 Boxes must be large enough so that at least one-half inch of carburizing material surrounds the parts on sides and bottom and one inch on top, to allow for shrinkage. Parts should be separated from each other by at least one-quarter inch of carburizing material. Cast iron box, in which articles are packed for case-hardening. superficial and won't stand any further finishing after being case-hardened as the hardening will be cut through. 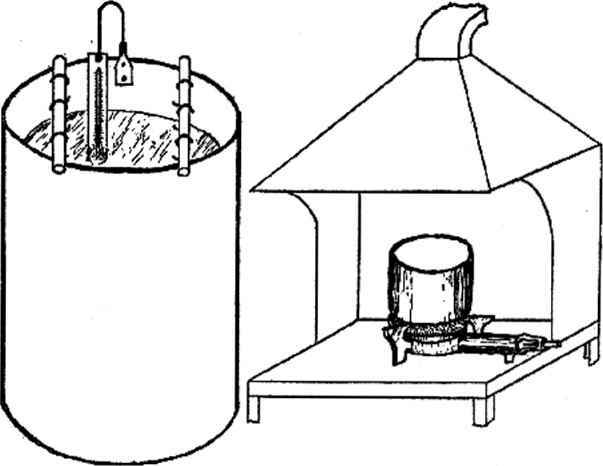 As the cyanide gives off deadly poisonous fumes, this type of case-hardening should be done in an open pot, under a hood attached to a flue with a good draft, and the operator should stand back from the pot. The best case-hardening is done by the pack-hardening method, that is, packing the articles to be hardened in iron boxes in which the article is surrounded bv powdered charcoal, coke, leather or bone and heated at a rather low heat over a long period of time. This method gives a deeper hardening and the temperature is more easily controlled. The time required varies with the size of the pieces. Temperatures may be held at 1550 degrees Fahrenheit. Green bone should never be used as a carburizing material, as it contains phosphorus. The carburizing material must also be free from sulphur and be perfectly dry. The lid of the box is sealed with fire clay and the thermocouple of the pyrometer is inserted through a hole in the lid, which is also sealed with fire clay. The high-carbon steels do not accept case-hardening as readily and therefore as deeply as do the low-carbon steels classed as machinery steel, of which cold-rolled steel is a good example. However, there are times when a high-carbon steel is required for a part and it is desired to give the part a very high surface hardness and for this purpose the high-carbon steel is used and is tempered after being case-hardened, the case-hardening giving an additional carbon content to the surface only. To harden the carbon placed in the steel, regardless of the type of steel used, by the case-hardening process it is necessary to quench the work while it is at the hardening heat. The poorest way to do this is to quench the work directly from the carburizing box, although it is the quickest method. This does not give the maximum strength and toughness. The best method is to allow the work to cool slowly in the box, remove it from the box when it is cold, place it in the furnace and reheat to the hardening temperature (1550 to 1600 degrees Fahrenheit) and then quench. This will give a good case-hardening and a tough core, but if the maximum is desired, quench it in oil after the reheating and then reheat the work a second time and quench it in water. This will give the toughest possible core and the finest crystalline case, with a graduation of case into core. As stated above, if a high-carbon steel of .90% to 1.25% is used for a case-hardened part, the temper may be drawn after hardening by heating to the correct tempering heat and quenching. Here are the tempering colors and temperatures. The proper heat treatment of a rifle or shotgun action requires quite a bit of equipment and considerable experience, so that in case the reader has only an action or two which he wishes to reheat-treat—either to re-harden worn spots, such as action-pin holes after reaming them to larger size and fitting new pins, or to re-color an action from which the finish has been worn— it would undoubtedly be best to send this work to a shop which can do it properly, without danger of warp-age or improper treatment. A centrally-located firm which can do this work properly and at a reasonable price is the Twin City Steel Treating Company, 1114 S. Third Street, Minneapolis, Minnesota. They can do either cyanide or pack hardening—either plain, to be blued, or in rich colors. The cost of this in the plain will run from 80? to $1.00, depending upon the size of the action, while in colors the cost will be $1.00 to $1.50 per action. 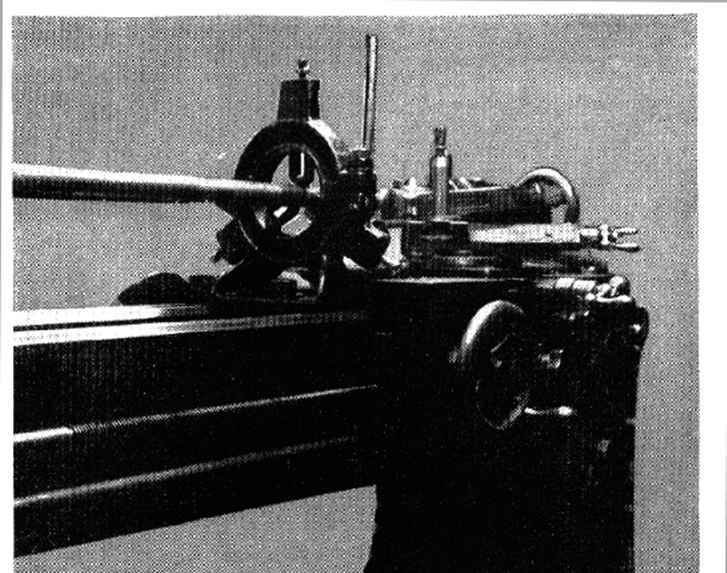 Lathe setup with steady rest supporting the rifle barrel while turning down some of its outside diameter. A straight portion is turned upon the barrel, long enough for the jaws of the steady rest to bear, about 8" from the tail center end of a barrel being machined upon centers in the lathe. The portion of the barrel from the tail center end to the jaws of the steady rest is then turned to size, after which another straight portion is machined upon the barrel 8" closer to the live spindle end and the steady rest is moved to the new position and this second scction turned to size. This operation is repeated until the full length of the barrel is turned to size.